Thread: google does not respect the CANONICAL tag? So this is not necessarily a problem as long as Google search console see the correct URL as the canonical URL with the URL inspection tool. You could add a 301 redirect for the other versions of the URL and or add a no-index on only the URLs that are canonical. Google can definitely see the correct canonical url, as seen from the screenshot. However I am afraid the site suffers from duplicate content since google has both pages indexed. Yes, however this is a forum software and it is not easy for me to make such changes. I have set a canonical tag and from what I understand google does not respond to it as expected. Lets remove the canonical tag for a moment. Now you have two pages that are exactly identical, but with different urls. Now both pages get indexed and Google shows them both indexed. Ok, this is a problem, so how do you solve this, you either "no index" the page or your remove the page, but because of your CMS system you can't. So you decide to put a canonical tag on these two pages. Now because both page are indexed you think Google is ignoring the canonical url. That is an incorrect assumption on your part. Google must be able to crawl the page to see the canonical. This means that the page is indexed but since Google sees the canonical, Google flows all the link juice to the canonical url. But you say, the page is still indexed and showing in the serps. That is correct behavior, the page is indexed and will show in the serps. The caveat is that no link juice flows to the non-canonical page. Which is exactly what you want to happen. The site: command can be miss-leading. All the site command does is tell you what are some of the pages that are indexed, but it is an incomplete list and what it doesn't tell you is the the link juice flows to the canonical url only. You have no problem. No offense, the issue is how you understand the workings of Google Indexing and Ranking. Your logic is flawed, sorry. Let me give you another example to explain why Google must be able to see and index the page. Lets say you have a page on your site. It has been up for many years, but you decide you don't want Google to crawl it or see it anymore for what ever reason. So now you block the page in your robots.txt file. Well a couple of months later you still see the page in the serps and wonder why. The reason is the page is already in the index, so you put a robots meta tag "noindex", "nofollow" on it and figure it is taken care of. But wait, two months later the page is still in the index. You are scratching your head and wondering, and say Google isn't honoring your robots meta tag "noindex", "nofollow" . Well Google is doing exactly what you have allowed Google to do. You blocked the page in robots.txt but since it is blocked, Google never sees the robots meta tag which would tell Google to not index the page. Remove the block in robots.txt and Google will next time it scans that specific page will honor the noindex, nofollow request. You don't have a problem, Google is doing what it should. It indexes the page, sees the canonical and flows all the link juice to the correct page. Thank you very much for te detailed answer. That is an incorrect assumption on your part. I do not think this is my case. This particular page was created on Nov 3, 2018. The canonical tag exists on my pages long long before. This means that google a) crawled the page (...?show=1119), b) detected the canonical tag and c) indexed the page. Do we agree in the sequence of those 3 events? According to Google search console this is the scenario for about 5-10 such forum pages (they are reported in Google Search Console, under "Indexed, not submitted in sitemap"). I have about 500 more forum pages that google behaved as I would expect. ie indexed the canonical page only, discarded the rest. Last edited by bobptz; Feb 13th, 2019 at 03:49 AM. Yes, we agree on this sequence of events. Let me add, this is exactly what is supposed to happen. If the page isn't crawlable, then Google can't honor the canonical. Google is telling you that all is ok, and your preferred page is the canonical page. If the page wasn't crawlable, Google would not see the canonical url. No where do you have the page marked "noindex", also you should not be marking this page "noindex". This page showing up in the index is normal even with the canonical to another page. You said: "This page showing up in the index is normal even with the canonical to another page." Maybe, but why this "normal" thing is happening for only a tiny fraction of my forum pages? Google reports that it is NOT included in the sitemap. But I checked, the canonical page IS included, the sitemap is automatically generated by the forum and includes all proper pages. Why is the one included and the other one excluded? So here I am afraid I suffer from duplicate content. Ok, it appears that your cup runeth over. The site: command does not, will not, has not ever shown a complete list of indexed urls. The command only shows a subset. Your guess is as good as any as to which urls they leave out, or include. The site: command only shows that the url is in the index. Again I stress, it is just a sampling of your indexed pages, it is not 100% complete nor 100% accurate. The site: command does not rank any given page for inclusion in any given query. Google has ranking algorithms that do that. You know them as Hummingbird, Rankbrain, Panda, Penguin, Fred, etc., etc.. So to use site: command to imply that a page is duplicate content and that Google is ignoring the "canonical url" is flawed. This will give you no real data. I would suggest you setup goals in your analytics. Track the pages and see where the traffic goes. 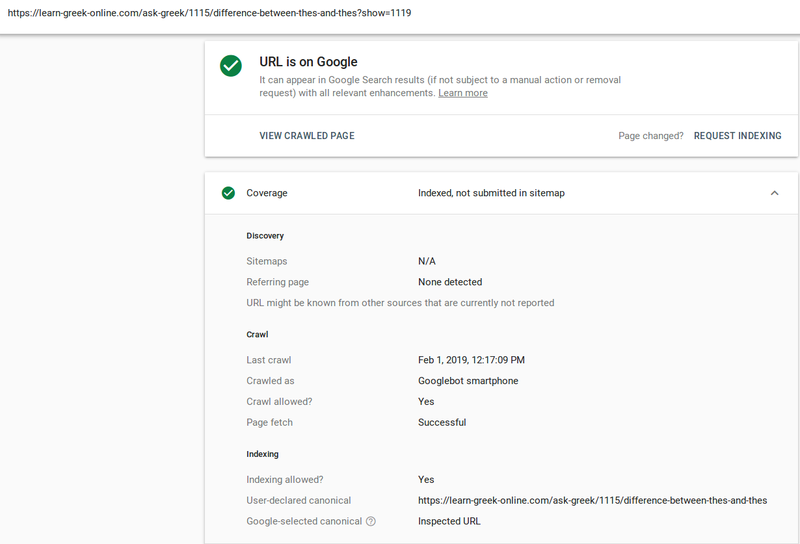 The point I am making is that your page "https://learn-greek-online.com/ask-greek/1115/difference-between-thes-and-thes" only shows up in the serps on gr.yahoo.com. None of the "non-canonical pages" show up. (1) The page isn't that important in the eyes of Google. (2) The only page showing up on any search engine of importance is showing the correct url as indicated by the canonical url, not any of your duplicate pages. So to me the conclusion is that the canonical url is doing its' job. How do you interpret this data ???? Run your own test if you doubt my opinion. We do agree on this, right? Why is the first (non-canonical) page in google index, while the second (non-canonical) page is not? As for the tests you run, I really appreciate the extra effort and time you gave me. I do not want to expand to this. Last edited by bobptz; Feb 14th, 2019 at 02:14 PM. Well it could just be that Google hasn't gotten around to dealing with that page. Notice all the pages are basically dated Nov 18th 2018. But your original question was "Google isn't honoring my canonical". But the long and short of it is, the correct page is being given credit so it really doesn't matter if the other page is indexed. It is not showing as duplicate content, it is not competing with the canonical url, it is not hurting you in any way. I would expend my efforts on things that do matter, but not this issue. Also, Google makes mistakes and sometimes they show the wrong results. The canonical is only a suggestion. The #post1236942 is VITAL to showing Google "this is a different part of this page, and not a different page"... what your CMS is doing is adding /?show=1133 which is a completely different page. You need to sort your problem from the root. Google may be ignoring the suggestion of a canonical because you're making the same mistake 100's of times. Change ?show= to #something and your problems will go away. There's literally no other way to solve it. Even if you add 301's, every time someone asks a new question you'll have to add a new 301. The # is a must! Edit: I guess you could also nofollow the answer link... but adding # is without doubt the best option. Last edited by matt1966; Feb 14th, 2019 at 03:22 PM. I do not have the knowledge to program what you suggested. Are older sites getting more respect from Google?